The first time I heard David Harrison, I thought he was an illustrator. The 2012 “Poetry for All” workshop would begin that afternoon. Folks were just arriving for their long weekend with Rebecca Dotlich, Eileen Spinelli, David, and guests. I stepped into the library, out of the rainstorm that swept in on that spring day. I kept one eye on the driveway, waiting for the next arrival. 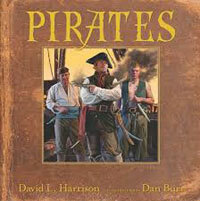 I didn’t know this at the time, but David Harrison stood at the far corner of the room with the book Pirates in his hand. I heard him gush over the illustrations alongside another man, their backs to me. David talked about the characters’ faces, the details, the richness of color. The way he spoke of the illustrations seemed familiar and showed a level of love and understanding of the illustration process. He then said something like, “And the poetry’s not half bad, either.” Both laughed. When they turned, I realized the kind words about color and character and detail were not from an illustrator. No, those words came from Mr. Harrison. Kindness radiates from David, and when it comes to critiquing others’ words, it is met with valuable advice and sharp insight. David will offer critiques at his upcoming workshop, How Do Poets Get Published? : Learning What it Takes. David sat down with us to talk more about the workshop and about his forthcoming projects. Alison: Hello, David! Welcome to our blog! What’s going on in your writing studio? David: Hi, Alison. Thank you for inviting me. I divide my work between books for children and books for teachers. In January 2016, Shell Education published Rhymes for the Times: Literacy Strategies Through Social Studies, co-authored with Timothy Rasinski (Kent State). For this one I wrote 60 poems – 20 each about U.S. states, American history, and ancient civilizations. 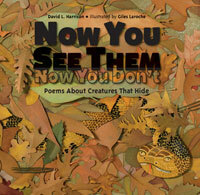 In February, Charlesbridge published Now You See Them, Now You Don’t: Poems About Creatures That Hide, beautifully illustrated by Giles Laroche. It received a Kirkus starred review and I enjoyed introducing it at the Texas Library Association Conference, where it sold out. While there, I also participated in Sylvia Vardell’s Poetry Roundup. In June, Colorado Reading Journal reprinted my article, “For the Fun of It, and the Learning Just Happens!” which was originally published in New England Reading Association Journal, Winter 2015. A number of my poems will appear in upcoming anthologies. My daily blog, http://davidlharrison.wordpress.com, features the monthly Word of the Month Poetry Challenge that attracts poets from beginners to pros across the U.S. and many other countries. In the works: a middle-grade novel set in the Amazon rainforest; a book for elementary-school classroom teachers about how to prepare their students to write (in collaboration with Mary Jo Fresch, Emeritus, Ohio State); the poetry chapter for the fifth edition (I wrote the third and fourth editions, too) of Children’s Literature in the Reading Program (edited by Deb Wooten, University of Tennessee); a collection of poetry for Charlesbridge; and two collections of poetry for Boyds Mills Press. Collaborators on other projects include Jane Yolen, Sandy Asher, Cheryl Harness, Rob Shepperson, Dan Burr, and naturalists Bob and Barb Kipfer. Several of my own manuscripts are also making the rounds, including a picture book called 10 Simple Steps to Housebreaking Your Cow. A number of ideas are in early stages. Alison: You have so many great projects coming out for both teachers and writers. And steps for housebreaking my cow. Sign me up! We hear so much about NOT writing in rhyme, yet your poetry collections are full of rhyme. While we have you here, can you clear up the misunderstandings involving rhyming picture books and collections of poetry? David: Relatively few poems, no matter how delightful they may be, can be stretched into a book by even the cleverest of illustrators. We might sing a lyrical poem or perform a narrative poem, but neither is likely to provide a complete story with enough scene changes to translate into a book. Even when someone pulls it off, the result may be disappointing and fail to hold young readers’ attention. A rhyming picture book, on the other hand, is first and foremost a story. It must meet the criteria of any story, but as an additional challenge, the author must tell it in verse. The difficulty of marrying two genres is that both masters must be served, and poetry usually comes out the loser. Too often, most of the elements of good poetry are sacrificed in the struggle to get the story told. For that reason, some editors prefer that their stories be told in prose. It’s a good idea to ask before submitting a rhyming picture book story. Alison: Thank you, David! I am certain many writers have a better understanding of when and how to use rhyme. Speaking of how, you have a workshop next month at the Foundation called “How Do Poets Get Published? : Learning What it Takes.” What can aspiring poets expect from this workshop? David: I look forward to conducting this latest poetry workshop at the wonderful facility that Kent Brown whimsically dubbed the Barn. Some barn! Writing poetry is hard and selling it is difficult, so I’m not surprised that dedicated aspiring poets are willing to spend their time and money to participate in a Foundation workshop. I note with pleasure that a number of previous attendees of my workshops are seeing some of their work appear in books and magazines. The amount of their success for which I claim credit is minimal, of course. The desire to write comes from within, and learning how to do it is a journey the writer must make, mostly alone. My job as mentor and leader is to make my workshop a practical step in the writer’s journey. To prepare for this workshop, I sent queries to people across the country who have previously joined me at the Barn and asked their advice for fashioning an event that would be of most use on their journey. They want to know how to get their poems into print. The niche for poetry seems to be an inch wide, a mile deep, and occupied by permanent residents whose names pop up in books all the time. We all know the way to Carnegie Hall, so this workshop will feature plenty of practice with particular focus on four subgenres of poetry: free verse, unrhymed verse, short-form rhymed verse, and long-form rhymed verse. Rather than meet with each participant once and cross that off the list, I’ll be present and available throughout each day to field questions and offer suggestions while our poets are engaged in crafting their poems. The not-so-hidden message here is that the better one masters the craft, the more improved the chances [are] of breaking through the barrier and hastening the day when dreams come true. Alison: Sounds like a wonderful opportunity for writers. It looks like your attendees will also enjoy some time with special guests. What do you have planned for the industry professionals that you invited? David: During previous workshops, I’ve been blessed by appearances via the magic of Skype by such notables as J. Patrick Lewis, Jane Yolen, Kenn Nesbitt, Larry Dane Brimner, and Renee LaTulippe. Their wisdom and special insights have been invaluable. For this new workshop, again being influenced by the advice of those I queried, I’m focusing more on the actual process of getting published and calling on the expertise of some people who will explain how it works. Collectively, they represent magazines as well as books, including some insights about the importance of writing with the artist’s needs in mind. Rebecca M. Davis is a senior editor for Boyds Mills Press and for WordSong, the only imprint in the United States dedicated to children’s poetry. Rebecca has been editing children’s books for more than 20 years. Mary Colgan is the Senior Editor of Highlights Press. In addition to her editorial duties, she develops and edits a wide range of projects herself, including poetry, activity books, board books, craft books, and chapter books. Mary is my editor. Allison Kane edits most of the poetry in Highlights magazine, as well as the mixed-page puzzles, recipes, games, cartoons, and activities. Her desk is piled high with poems, puzzles, and letters from kids. Patrick Greenish Jr. is Art Director for Highlights for Children. He is responsible for designing Highlights and finding artists to bring the stories to life. He has been in magazine publishing his entire career. Want to know what it takes to get published? Ask people who make those decisions every day. Participants will find their advice invaluable. Alison: I read that your publishing team will run a mock editorial meeting using your attendees’ projects. Talk about valuable feedback! Our workshops all offer a good amount of feedback and critique. We feel this mentorship is what makes the difference for working writers. We are grateful for all of the hours you’ve given as a mentor to our conferees. What kinds of mentors have you had during your publishing career? David: I think our mentors change as our needs change. As a young man wanting desperately to become published, I would have given anything for just one person who would tell me what to do. I remember those days when someone asks my opinion and I can offer a word of advice. As for me, I never found that mentor in one person. Instead, I draw comfort/wisdom/inspiration/ideas from many people, including writing partners, editors, and – sometimes – reviewers! Read The Writing Thief by Ruth Culham to get an idea of how writers swipe good stuff by others as mentor texts for inspiration. Joy Acey, who has attended some of my Foundation workshops, as well as others, just sent me a mentor text from Dimestore, A Writer’s Life, by Lee Smith. It’s so beautifully written, and I look forward to reading it and learning from it again. Thank you for bringing me to your blog. I’ve enjoyed our visit. Alison: David, it’s our pleasure! See you next month at the Barn.